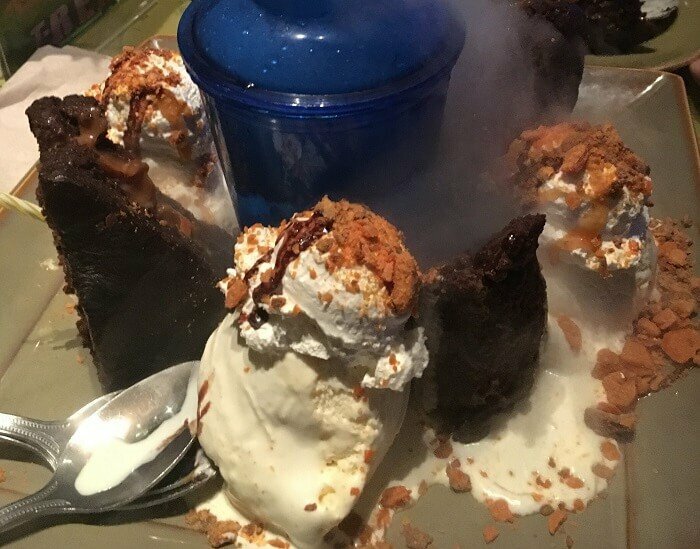 Some of the best desserts you can find at Walt Disney World Resort in Orlando, Florida are at Rainforest Cafe (in Animal Kingdom and Disney Springs) and T-Rex Restaurant (in Disney Springs). If you would like to try these delicious desserts – without having to pay money – then check out great deal going on. Both Rainforest Cafe and T-Rex Restaurant are Landry’s Restaurants, and they have a great Landry’s Select Club program going that can help you save money on visits, get in quickly without making a reservation, get free gift cards, etc. (please see more information about the Landry’s Select Club program here). If you aren’t already a Landry’s Select Club member you should become one to save money at both restaurants in general but you should especially join right now. Because right now, Landry’s Select Club members can get a free dessert, up to $9, with the purchase of an entree. Please be aware this deal ends on September 23rd. And if you want to know how to save even more money on dining Disney World, please see our tips on how to get other Disney World dining for free. Also, if this date inspires you to take a last minute Disney World trip, here’s advice on what websites save you money on Disney World hotels and where to find the lowest prices for Disney World tickets. Polynesian vs. Wilderness Lodge: Which Disney World Hotel is for You?